Cut the brinjals into thin strips,make cross incisions on the outer side. Add salt n mix well.dust the brinjal strips with flour.Deep fry till crispy n keep aside on an absorbent paper. Heat oil in a pan,add ginger-garlic paste.fry for a few seconds.Add red chillies n MSG. 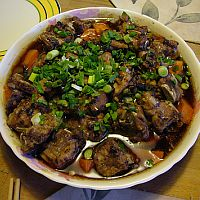 In the mean-time,take sugar,salt,soya sauce,vinegar,cornflour-water mixture,chicken powder in a bowl.mix well. Add this to the pan.Stir constantly till it thickens like sauce. Place the fried brinjal strips on a serving platter.Pour the sauce over it. To Areen & Panchi, brinjals are very commonly used in China. In China, it known as eggplant. In US it easily available in every grocery store. BTW this is nice recipe. MSG,also called as ajinamoto,is a ingredient used in the chinese dishes...it is easily available in the market..
Thnx mayask...nice to get the nutrition details..nd also thnx for d pic! Hi ! Panchi .... Oops ! I forgot .... Awesome pic ! Hi ! Panchi .... Tried out Ur recipe yesterday minus MSG . It was gud . Thank U . Brinjal is a very gud source of dietary fiber , Potassium , Manganese , Copper . Also gud source of Vit B6 , Folate , Iron , Zinc Magnesium etc . Brinjal helps in regulating high blood Cholesterol , Checks Diabetes , Improves Digestion , Cures Insomnia , Treats Epilepsy and Convulsion . Prevents Rheumatiod Arthritis nd helps in treating enlarged spleen . Thanx Areen..ya,brinjal is not a chinese vegetable.bt as i love chinese i simply tried it in the chinese style,i hop u'll like it..
Never heard of this as Brinjal are not really Chinese vegetable but I am sure it will taste good as I love Brinjal, Thank you.